As I see it, there are three good reasons why SUVs currently outsell sedans by an almost 2-1 margin. 1. Older Auto buyers. Older drivers like the ease of access as well as loading and unloading cargo, the elevated and enhanced visibilty, and the ergonomic benefits of sitting up with legs down. (which also makes trucks quite popular). 2. Young families. Not only is raising kids an equipment sport, sometime try putting a child's carseat in a sedan second row. 3. Climate change. SUVs do bad weather better. 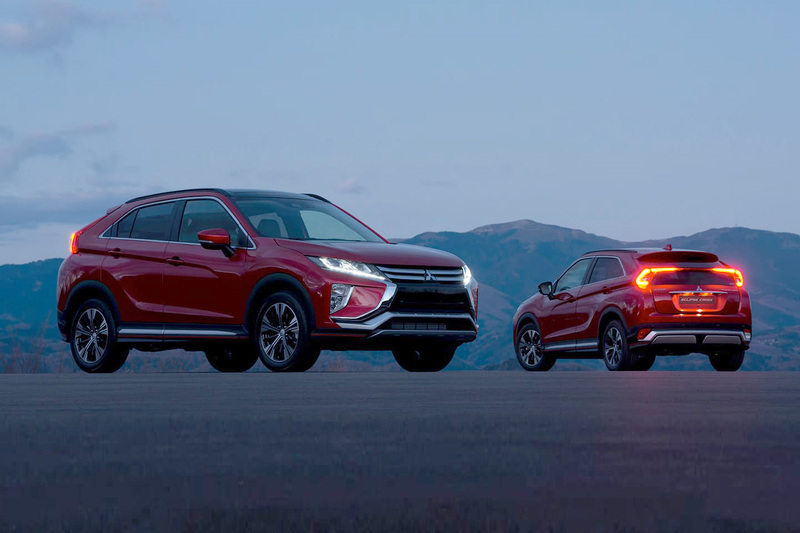 This is Year 2 for the Mitsubishi Eclipse Cross, and it is continuing with its affordable sticker - 24K base (MSRP - check your dealer for incentives) and the peace of mind that accompanies the Mitsubishi five-year/60,000-mile basic, and the 10-year/100,000-mile powertrain warranty. There are 5 trims* to choose from: 2 ES (with or without AWC), LE, SE, and SEL. The exterior design has a flashy aerodynamic downhill slant with a no-nonsense assertive grill amd headlight style. Available metallic colors: Alloy Silver, Tarmac Black, Pearl White (non metallic), Octane Blue, Mercury Gray, and Bronze. The interior for all come in fabric black. 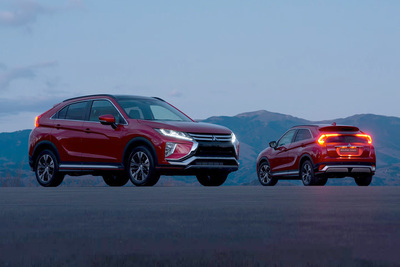 The Eclipse Cross is powered by a turbocharged 1.5-liter 4-cylinder engine making 152 horsepower and 184 lb-ft of torque and is connected to a continuously variable transmission (CVT). This system is well suited to the size and weight of the vehicle providing adequate acceleration when the lights turn green without sacrificing gas mileage. We got mid to upper 20's depending on terrain and driving practices. The basic ES uses front-wheel drive, but all the others have all-wheel drive - very useful for wet and slippery conditions. Ride, handling, and turning radius all performed quite well, and the aerodynamics and sound-deadening materials keep the interior noticeably quiet. Depending on your digital skills, the touchscreen controls may take a bit of getting used to for the infotainment system, but become second nature. And you can always use Apple CarPlay and Android Auto. Standard safety features the usual anti-lock brakes and traction/stability control, and also hill-start assistance. We tested the SE 1.5T S-AWC which pushes up the sticker by a couple thousand, but it is worth it to add heated front seats, dual-zone automatic climate control, automatic on/off headlights, power-folding side mirrors, rain-sensing wipers, key-less entry/ignition, leather-wrapped steering wheel/shift knob, illuminated vanity mirrors, 6-speaker audio setup, rear center armrest, electronic parking brake, blind spot monitoring with rear cross-traffic alert. So if you need to keep your car payments low, and you need the benefits of an SUV, be sure to test drive the Eclipse Cross.